Police and animal welfare organizations are asking you to remember your pets in these frigid temperatures. 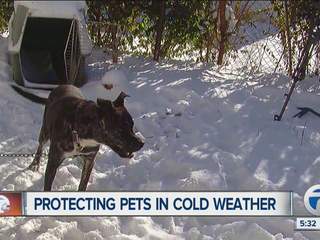 Volunteers with the Animal Care Network went to work to make sure dogs weren’t left out in the dangerous cold on Friday. They drove through neighborhoods in Pontiac looking for animals in need. It was disturbingly easy to find animals suffering. At one home, they found a dog left outside with no hay in a doghouse, no food, and a frozen water bowl. The owner was not home. They left the dog food, water, and filled his doghouse with straw. They left a note for the owner. Their goal is educating people about proper care of pets. If the conditions aren’t addressed though, they will contact authorities. Many Pit Bull owners said they didn’t realize the breed has a thin coat that isn’t sufficient for comfortable survival in cold weather. She and other volunteers say unfortunately they have seen what can happen when dogs are left outside in the elements. They have found numerous dogs dead or near dead while working to help animals. If you see an animal suffering, they ask you to report it. “You are the only voice that animal has,” said Heather Grace, an Animal Action Network volunteer. Their organization provides hay and dog food to those in need if requested. They are always in need of donations and volunteers. You can learn more at https://michigananimaladoptionnetwork.org/ .